Breitbart reports researchers have designed an epidermal electronic system that blurs the line between electronics and biology. The invention has a broad range of applications, including the medical field but also espionage and entertainment. The micro-electronics technology, called an epidermal electronic system (EES), was developed by an international team of researchers from the United States, China and Singapore, and is described in the journal Science. "It's a technology that blurs the distinction between electronics and biology," said co-author John Rogers, a professor in materials science and engineering at the University of Illinois at Urbana-Champaign. "Our goal was to develop an electronic technology that could integrate with the skin in a way that is mechanically and physiologically invisible to the user." 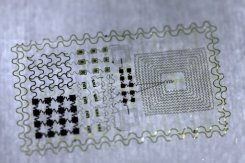 The patch could be used instead of bulky electrodes to monitor brain, heart and muscle tissue activity and when placed on the throat it allowed users to operate a voice-activated video game with better than 90 percent accuracy.